My husband, Robin, son Kai and I moved to Vietnam almost two years ago. At first we found all the many sounds culturally charming. They soon became annoying. Then — just before our nerve-endings short-circuited — our Vietnamese friends introduced us to the city’s coffeehouses, havens where punters go to escape the perpetual motion and sounds of a city that bursts at the seams. Cafes that serve iced coffees and ice cream are understandably popular in this hot, muggy city and such venues sit on nearly every corner awaiting weary tourists. These coffeehouses in particular have become my favourites because they are unusually peaceful oases in really clever settings. Each is secretly tucked away in a tiny alley off the busy streets. 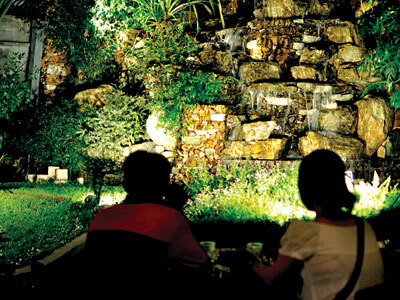 Some sit under a canopy of flowering trees with tables set next to waterfalls, koi ponds and sleeping Buddha statues. Some have soft couches with pillows and teddy bears to hug. 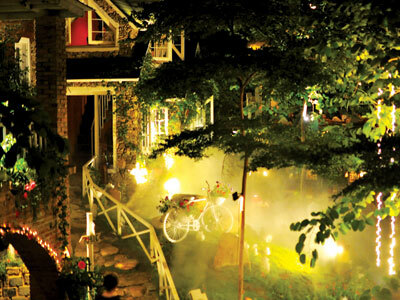 In the evening, candles are lit, greenery is draped with strings of miniature lights, and soft live music is performed. Best of all, the prices are low and no one hurries you. And, of course, in case you didn’t know, Vietnam is the second largest exporter of coffee in the world. The exported beans are generally low-grade robusta used in the blends making up instant coffee, although many farmers are now starting to grow the more labour-intensive and costly arabica.Fortunately, much of the best stuff stays in house, and the mainly robusta beens that make up cafe da or cafe sua da have a dark, rich flavour difficult to find elsewhere. I never liked coffee until I moved here. Now I’m addicted to it. No one at this café minded that my friends brought in a big birthday cake for me. The waiters even brought out a knife, plates and spoons for us. We ordered drinks and ice cream and had a wonderful party. With falling water, natural woods, and shallow pools framed by tropical plants and fans with mist providing a pleasant backdrop, guests could be forgiven for feeling as though they are in a cool forest. Smoothies, ice creams and coffees all come whimsically decorated in pretty glassware with dollops of cream, little cookies, curly straws and tiny paper umbrellas. Each is about US$1.75. Beer is US$1.80 and snacks, such as French fries with butter and sugar, are US$1.40. Hours: from 7am to 11pm. This coffeehouse is similarly decorated to the one above by dint of sharing the same owner. 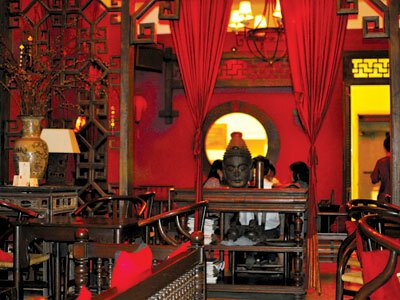 It can seat about 200 patrons, but with tables cleverly situated around different ponds and bubbling fountains, or tucked away behind curtains of hanging philodendrons, it doesn’t feel crowded. Some of the menu translations for English speakers are amusing: For example, you can order fresh “squashed juicest.” Every order is accompanied by delicious iced jasmine tea, which is refilled constantly. Banana splits made with tiny finger bananas are US$2.50, beef noodle soup or seafood with noodles is US$2 and smoothies made with papaya and avocado are US$1.80. Hours: daily from 7am to 11pm. Most real estate in Ho Chi Minh City is set on narrow but long pieces of land. The entrance to this café is on a busy street, but once patrons walk on stepping stones through a thin corridor of garden to reach the main room they won’t hear the din of traffic. 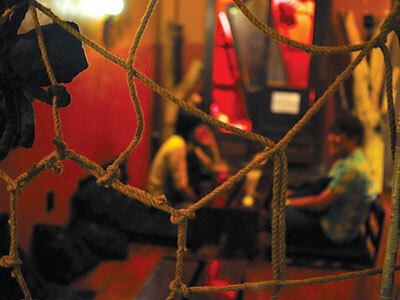 The coffeehouse is made up of many small rooms, either set in the open air or under a roof. It’s OK to plug your laptop in and sit for hours in a quiet corner getting inspiration among the flowers, trees and climbing ivy. Guests can order yoghurt drinks, fruit shakes, fresh juices and coffee for US$1.50. Coconut ice cream is served in a fresh hollowed-out coconut for US$3. The milk and meat from the coconut is served on the side. Live music begins at 7pm each night. Hours: daily 7am to 11pm. Patrons enter by walking on stepping stones through a koi pond and water drips from streams between tables. With gentle rain and soft music providing a comforting accompaniment, visitors might want to curl up on the couches and go to sleep. Waiting staff in traditional Vietnamese costume hand out menus printed on pieces of soft leather — creative, but difficult to read. With many businesses nearby, this café has a busy breakfast clientele who order sticky rice with meat, braised pork noodles or eggs on a French baguette. But I like to go in the evening to take advantage of the soft lights, peaceful atmosphere and delicious coffees served over ice cream. Prices range from US$2 to US$4 for beverages and US$3 to US$6 for entrees such as grilled fish and stir-fried vegetables. Hours: daily 6.30am to 11pm. 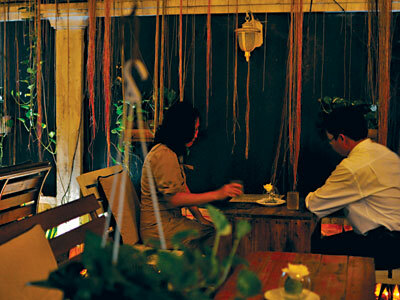 Ngoc Anh, a former winner of Vietnam Idol, is the celebrity owner of this funky, clever coffeehouse. The theme may be spiders, but they’re not dangerous. Giant fuzzy critters crawl on rope webs that separate low tables and pillows for chairs, pink and green painted walls and chic curtains. After ordering drinks or ice cream, you can take a magazine from the shelf, sit back and relax. Friday nights from 6.30pm to 10.30pm usually involve comedy and music. Smoothies are US$1.50, coffee is US$1.25 and ice cream is US$1.80. Hours: daily 8.30am to 10.30pm. This café is about 25 minutes outside the city centre, but close enough to the airport to warrant a place on my list. If you check out of your hotel at noon and your flight isn’t until evening, this is a wonderful place to wait. The café’s name implies its décor with plenty of ceramic ducks and picket fences. 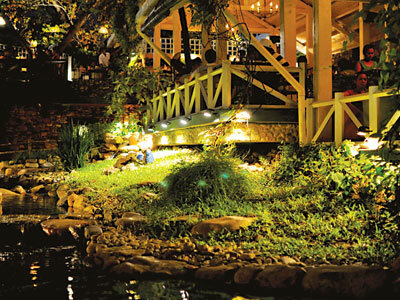 There are cushy upholstered chairs, wooden bridges that cross a pretty fountain between table areas, and a porch swing. There are so many cute places to sit it’s hard to choose where. You can sit under a colourful umbrella in a patio area with wooden tables and chairs, or enjoy a living room setting with couches and soft lights. Coffee is US$1.50, fruit smoothies are US$3, lemonade with peppermint syrup is US$1.75, ice cream topped with pears or rum is US$3.50, and bowls of noodle soup or fried rice are US$3.